Freedom, generally, is having an ability to act or change without constraint. A thing is "free" if it can change its state easily and is not constrained in its present state. In philosophy and religion, it is associated with having free will and being without undue or unjust constraints, or enslavement, and is an idea closely related to the concept of liberty. A person has the freedom to do things that will not, in theory or in practice, be prevented by other forces. Outside of the human realm, freedom generally does not have this political or psychological dimension. A rusty lock might be oiled so that the key has freedom to turn, undergrowth may be hacked away to give a newly planted sapling freedom to grow, or a mathematician may study an equation having many degrees of freedom. In mechanical engineering, "freedom" describes the number of independent motions that are allowed to a body or system, which is generally referred to as degrees of freedom." In political discourse, political freedom is often associated with liberty and autonomy in the sense of "giving oneself their own laws", and with having rights and the civil liberties with which to exercise them without undue interference by the state. 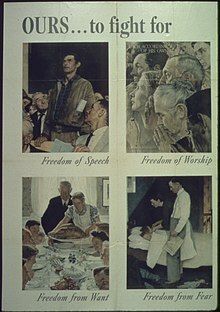 Frequently discussed kinds of political freedom include freedom of assembly, freedom of association, freedom of choice, and freedom of speech. In some circumstances, particularly when discussion is limited to political freedoms, the terms "freedom" and "liberty" tend to be used interchangeably. Elsewhere, however, subtle distinctions between freedom and liberty have been noted. John Stuart Mill, differentiated liberty from freedom in that freedom is primarily, if not exclusively, the ability to do as one wills and what one has the power to do; whereas liberty concerns the absence of arbitrary restraints and takes into account the rights of all involved. As such, the exercise of liberty is subject to capability and limited by the rights of others. Liberty is linked to human subjectivity; freedom is not. The Declaration of Independence, for example, describes men as having liberty and the nation as being free. Free will—the quality of being free from the control of fate or necessity—may first have been attributed to human will, but Newtonian physics attributes freedom—degrees of freedom, free bodies—to objects. Freedom differs from liberty as control differs from discipline. Liberty, like discipline, is linked to institutions and political parties, whether liberal or libertarian; freedom is not. Although freedom can work for or against institutions, it is not bound to them—it travels through unofficial networks. To have liberty is to be liberated from something; to be free is to be self-determining, autonomous. Freedom can or cannot exist within a state of liberty: one can be liberated yet unfree, or free yet enslaved (Orlando Patterson has argued in Freedom: Freedom in the Making of Western Culture that freedom arose from the yearnings of slaves). ^ See Bertrand Badie, Dirk Berg-Schlosser, Leonardo Morlino, International Encyclopedia of Political Science (2011), p. 1447: "Throughout this entry, incidentally, the terms freedom and liberty are used interchangeably". ^ a b c Anna Wierzbicka, Understanding Cultures Through Their Key Words (1997), p. 130-31: "Unfortunately... the English words freedom and liberty are used interchangeably. This is confusing because these two do not mean the same, and in fact what [Isaiah] Berlin calls "the notion of 'negative' freedom" has become largely incorporated in the word freedom, whereas the word liberty in its earlier meaning was much closer to the Latin libertas and in its current meaning reflects a different concept, which is a product of the Anglo-Saxon culture". ^ Wendy Hui Kyong Chun, Control and Freedom: Power and Paranoia in the Age of Fiber Optics (2008), p. 9: "Although used interchangeably, freedom and liberty have significantly different etymologies and histories. According to the Oxford English Dictionary, the Old English frei (derived from Sanskrit) meant dear and described all those close or related to the head of the family (hence friends). Conversely in Latin, libertas denoted the legal state of being free versus enslaved and was later extended to children (liberi), meaning literally the free members of the household. Those who are one's friends are free; those who are not are slaves". ^ a b Wendy Hui Kyong Chun, Control and Freedom: Power and Paranoia in the Age of Fiber Optics (2008), p. 9. Look up freedom in Wiktionary, the free dictionary.